Inspired by Chandra the Moon, light and airy fragrance. 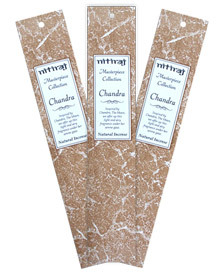 This type of incense is known as a masala which means spice. This is because the incense is made from a complex blend of natural fragrant oils, forest herbs and spices. This results in a soft incense that always remains moist, for this reason it's very slow burning. Each incense stick will burn for an hour.